RBTH presents a selection of views from leading Russian media on the latest developments in Ukraine, featuring analysis of the Independence Day parades in Kiev on August 24, German Chancellor Angela Merkel’s visit to Ukraine, and a new militia offensive in the east of the country. 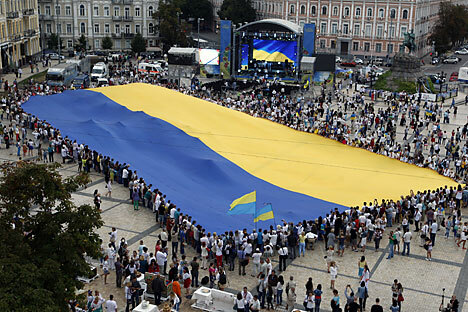 The Nezavisimaya Gazeta daily reports about the Independence Day celebrations in Ukraine on August 24: "On Sunday, military parades were held in Kiev and Odessa, while other big cities staged rallies and vyshyvanka [ethnic Ukrainian dress] marches. At the same time, the situation in the east of the country became even more acute. Supporters of the self-proclaimed Lugansk and Donetsk people's republics mounted an offensive, while the situation of civilians who still remain in the conflict zone has become critical." On the previous day, Saturday, German Chancellor Angela Merkel paid a visit to Kiev. At a news conference after the talks, she clarified Germany's position on the possible federalization of Ukraine: "When we speak of federalization, we mean the German format. We understand that in Ukraine it is called decentralization. This is exactly what President Poroshenko wants. And we support it." The Kommersant daily analyzes the speech delivered by Ukrainian President Petro Poroshenko at the Independence Day parade in Kiev on August 24. "Although there were expectations that Petro Poroshenko's address would contain some tough rhetoric, the Ukrainian president's speech could not be described as particularly belligerent. Experts link it to German Chancellor Angela Merkel's visit to Kiev on the previous day and her initiative for a truce in the east of the country as well as to a possible meeting between Petro Poroshenko and Russian President Vladimir Putin in Minsk on Tuesday," the paper points out. The Rossiyskaya Gazeta official daily also writes about the military parade in Kiev, during which President Poroshenko compared the "antiterrorist operation" in the Donbass to the Great Patriotic War [the name commonly used by Russians for World War II – RBTH] and promised some 40 billion hryvnias (about $3.5 billion) in allocations for the country's armed forces. Finally, he accused Russia of all of Ukraine's troubles and of military aggression by way of delivering humanitarian aid. The Moskovsky Komsomolets daily reports that while Independence Day celebrations were being held in Kiev, two large groups of government forces, comprising several thousand servicemen and several dozen pieces of military hardware, became surrounded in the Donbass. "On the eve of Independence Day, the National Security and Defense Service of Ukraine held a closed session at which the latest figures for losses suffered by the Ukrainian army in the southeast of the country were announced. The official figures are shocking: 12,000 people killed and 19,000 wounded, while those missing have not even been counted," writes Moskovsky Komsomolets.